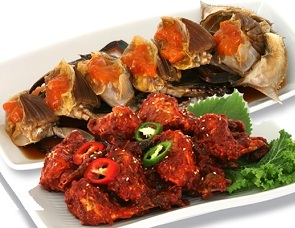 Yangnyum or ganjang gaejang is a Korean seafood cuisine which is made by marinating fresh raw crabs either in soy sauce or in gochujang (hot pepper paste). The term consists of the two words; gae, meaning crab, and jang which means condiment in Korean. Although gaejang originally referred only to crabs marinated in soy sauce, it has begun to be called ganjang gaejang these days to differentiate it from yangnyum gaejang. To prepare, crabs are first thoroughly cleaned using a brush while submerged in a bowl of cold water and then rinsed thoroughly to remove the excess fishy smell. For its sauce, a mixture of soy sauce is boiled briefly along with sesame oil, lemon, sugar, finely sliced scallions, minced garlic, ginger, and finely shredded chili peppers. The hot soy sauce is poured onto the crabs in a large bowl and then cooled -- this step may be repeated multiple times by draining, re-boiling and re-pouring the sauce sauce content to enhance its flavor. As for yangnyum gaejang, raw crabs are marinated with a mixture of gochujang sauce, ground Korean pear, onions, ginger and garlic, sesame seeds, and sesame oil. For optimal taste, marination should be for half a day to 3 full days to have its spicy, sweet and sour taste get fully intact to crab meat. Fact: Jeju Island is famous for their own signature gaejang dish.